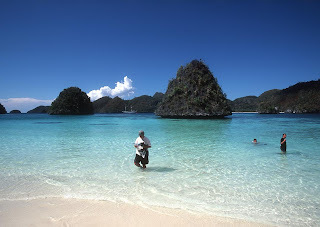 Raja Ampat is the an archipelago located in the Papua province of Indonesia. This area is rich in tourist beauty of the sea. That said, the beauty of the King of Coral Reefs. 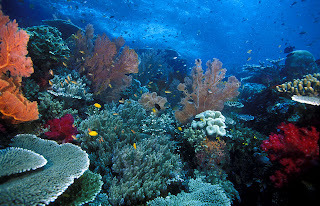 In place of this week there were about 75% of the existing type of Coral Reefs of the World. So for those of you who like to dive diving alias, not complete if not yet dive in and see the beautiful coral reefs of the Raja Ampat Islands. But you have to order first when it's time to dive because you can schedule to do the here has a list of queued outstanding amount of travelers in domestic and foreign. Raja Ampat or 'Four Kings' is the name given to these islands. A name derived from a local myth. The four main islands that is the Waigeo, Salawati, Batanta, Misool who is the producer of the ancient rock paintings. Underwater tours lovers from around the world flocked to it to enjoy the best underwater scenery in the world are amazing. Two days earlier, when you're in a crowded Bali wrapped in sacred art as well as catching a plane to the head end of New Guinea birds. Furthermore, be prepared for an unforgettable adventure. Start your tour from here to dive under the sea is the most beautiful. Explore the underwater vertical walls that. Feel the tension also diving, palpitations while vacillating ocean currents. That certainly will be an unforgettable personal experience in Raja Ampat. 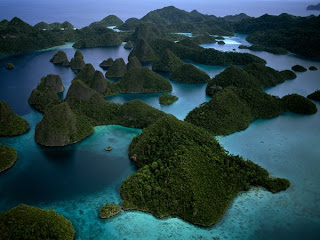 Area of ​​the islands in the Raja Ampat is large, covering 4.6 million hectares of land and sea. This is where the home to 540 species of coral, 1511 species of fish and 700 species of molluscs. Biota wealth has made ​​Raja Ampat as a living library of the collection of coral reefs and marine life of the world's most diverse. In fact, according to a report by The Nature Conservancy and Conservation International, there are about 75% of the world's marine species live in this amazing island. Unique species that can be found at the diving is the some kind of dwarf seahorses, wobbegong, Manta and stingrays. There are also endemic fish of Raja Ampat, namely Eviota king, which is a kind of fish gobbie. At the supernal point Manta Arborek Dampier Strait, you can dive with Manta Ray was accompanied by a tail like a tame when you dive in Derawan Islands, East Kalimantan. If you dive at Cape Kri or Chicken Reef, you can be surrounded by thousands of fish. Sometimes a collection of tuna, giant trevallies and snappers. But the tense when we are surrounded by a collection of barracuda fish, even though it is relatively harmless (which is dangerous if we see a solitary barracuda or alone). Reef sharks are also frequently seen, and with luck you can also see the turtle is still eating sponge or swim around you. In some places like in Salawati, Batanta and Waigeo also seen Dugong or sea cow. Because the area is consists of many islands and narrow straits, then most of the dive at a particular time has a strong current. It is also possible to do a drift dive, dive, following a strong flow of water is very clear with her ​​through the collection of fish. It's amazing.